Ecosystem processes are the physical, chemical and biological actions and events that link organisms and their environment. They include decomposition, production of plant matter, and nutrient cycling. These processes act as services, providing us with food, clean drinking water, and pharmaceuticals. They also regulate climate, sequester carbon, pollinate our food crops, and recycle water and minerals within every environment. Ecosystem processes can also include a cultural benefit, such as recreation, scientific study, and spiritual inspiration. They keep the community dynamics of the environment healthy and the flow of energy consistent. Biodiversity and a functioning ecosystem is fundamental to the health of the environment. The impact humans have on the environment have shown to cause general decline in diversity and predictable shifts in ecosystem functionality *1. The change in ecosystem composition is caused by introduction of species, species extinction, nitrogen deposition, fragmentation, predator decimation, and alternative management practices *2. Inadequate management of the landscape is a direct effect on the environment by humans and is the leading cause of desertification worldwide *3. The most widely published case of ill land management, that lead to desertification, was the Dust Bowl in America during the great depression area. Precipitated by the 1862 Homestead Act, a wave of new settlements and farm cultivation spread across the western plains of America. Deep plowing, over-grazing from cattle farming, and several droughts at the beginning of the 20th century eroded the virgin top soil so severely that millions of acres of farmland became useless *4. Dust storms from high winds lifted the dried soil, blocking out the sun for days at a time, became known as ‘Black Blizzards’. The ecosystem service, prairie grasslands provided by holding soil in place and prevented loss of water moisture from evaporation, had been destroyed. Before the devastating farming that started in the late 1800’s, the American Great Plains were the largest biome in the world next to the Boreal Forest *5. By 1935 New Mexico, South Dakota, North Dakota, Oklahoma, and Colorado had the highest percent of family farms on relief, most of which were on the Plains of those states *6. 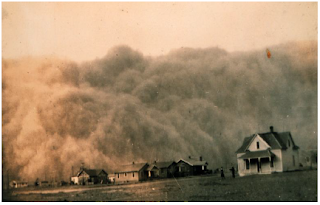 The product of misguided agricultural policy and unregulated settlement of the land, the Dust Bowl in 1934 was the ecological consequence of earlier decades of too-assertive agriculture *6. Today the United States is the fourth most severely affected country by land degradation worldwide and recent droughts have increased vulnerable areas, prone to desertification, by 2% *7. Globally, land degradation affects 1 billion people and every year it gets worse, with an estimated 20 million hectares of arable land being lost annually *7. The world should have heeded the warning from these devastating events, but many developing countries, such as China, have not learned the lesson. In the last 40 years, northern China’s rates of desertification have reached as high as 1.64% with 65.51% of the arid and semi-arid lands becoming deserts *8. In 1995 it was reported that the total cost to China was 600 million USD. However, worldwide that cost sky rockets to USD 40 billion annually *7. Not included in these costs is the need for increased fertilization, poor health, malnutrition, and the loss of biodiversity *7. The loss of biodiversity through disruption of ecosystem processes is not restricted to the terrestrial environment. Marine biodiversity loss is increasingly diminishing the ocean's capacity to provide food, maintain water quality, and recover from distresses *9. The over-exploitation of marine resources has a strong top-down force that often has far reaching effects on ecosystem structure and function. The functional diversity of the marine ecosystem has shown that as resources disappear, diversity declines sharply along with the ability to recover, stability in the ecosystem, and water quality *9. The reverse has also shown to be true, increasing biodiversity increases productivity and stabilizes the ecosystem *9. Resources: Habitat Change and Disruption of Ecosystem Processes, Prioritizing rehabilitation activities, Rhythm of conservation. Are we making new mistakes or the same old ones?